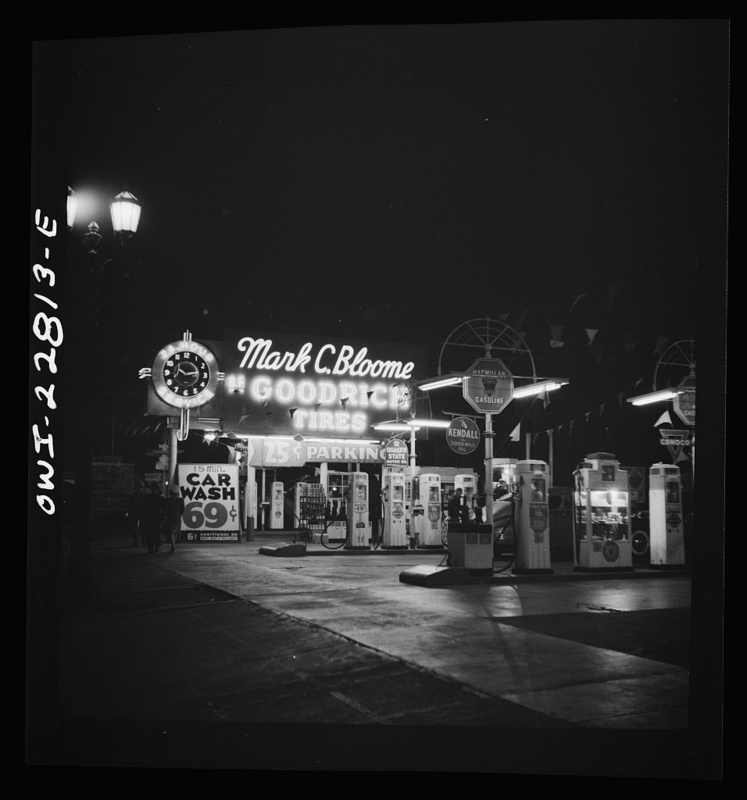 ART OF TRAFFIC: A gas station in Hollywood in April 1942. Click above for a great new online tool from Yale University that makes it easier to view photos in the Library of Congress taken across the U.S. between 1935 and 1944 and intended to chronicle the Great Depression and life in America. Photo by Russell Lee/Library of Congress. And on to the headlines…. West L.A. is on the docket for later this afternoon and downtown Los Angeles and East Los Angeles for Tuesday morning. Please follow our Twitter account for updates on bus detours. Coverage of yesterday’s vote by the Metro Board. A Metro spokesman says the Metro Board has the right to amend an existing station naming policy that discourages facilities from being named after living people. The High Desert Corridor project’s environmental document was released by Caltrans earlier this week and the cover — as noted by Streetsblog LA and Times reporter Laura Nelson — is a little different than the usual EIR. The study contemplates a new 63-mile freeway between Palmdale in Los Angeles County and the town of Apple Valley in San Bernardino County, along with a possible high-speed rail line, bikeway and green energy transmission corridor. BTW, the federally-threatened desert tortoise lives in the Mojave Desert; the document explains impacts and mitigations for the tortoise. Bottom line: cancer causing toxins are down by 65 percent but the air is still often a hot mess of pollutants, with emissions from trucks, ships, trains (most of which are freight in our region) and planes largely to blame. You can certainly add the Los Angeles region to the list of places trying to expand transit. Metro currently has four rail lines under construction and a fifth — the first phase of the Purple Line Extension — is soon to begin. If Metro pursues a ballot measure in 2016 to accelerate and/or expand the building of new transportation projects, it will be interesting to see if climate change is part of a political campaign. If memory serves, traffic relief and rail safety were part of the Measure R campaign. Denver has boomed in recent years and behind their 2004 transit sales tax, has been on a rail and BRT building boom. But new economic stats reveal the extent to which the ‘new economy’ in Denver is tied to the fossil fuel industry. Smart story. Check out the pics of the new lanes, which are painted red. They do stand out. The lanes aren’t very long, but are intended to help buses get through parts of town where traffic has traditionally added unnecessary minutes to bus trips. A few pics and tweets from CicLAvia, the heart of L.A. I don’t have as much of an issue as naming stations after living people but naming stations after active MTA board members is a huge issue to me. I still want the Expo/Sepulveda station named after Barret Hansen (Dr. Demento). Is that station near Pico & Sepulveda? Name it the Felix Figueroa station and confuse every one! Dr Dementia station would be rad. Iphone spellcheck curse-dr demento, not dimentia!! Are you kidding me, Zev is the one helped kill the Red Line from going no further then NoHo and he also had a helping hand in killing the light rail along the Orange Line. This is like the Metro telling the people of the Valley to go “F-off” we don’t care what you think. So in effect, this is like Washington DC naming their airport after Ronald Reagan. We could always do what residents there do, and tell people not to use the new official name. Zev and his Westside friends also killed the East L.A. subway. Now that they’ve changed their minds about the Wilshire subway, they want all the money for themselves. Three rail lines (Expo, Purple Line and 405 corridor) on the Westside, really ? Not all those rail lines are Westside-exclusive. The Purple Line Extension, of course, connects to downtown L.A. and the San Fernando Valley. The Sepulveda Pass Transit Corridor serves the San Fernando Valley as much as it does the Westside. The Expo Line also serves South L.A. (the northern part, admittedly) and will be an east-west link for those coming north on the Crenshaw/LAX Line. It’s probably worth mentioning that the Westside is the number two job center in the county, thus the push to provide transit there and links to other parts of the county. Don’t eat too much Skyline Chili now. Too late for that, Brendan! First stop after leaving the airport. Pretty amusing metro’s amnesia on Zev. Mr Anti-Subway gets a subways station named after him. Good job metro. As the article and motion state it still comes up for another vote in January. There will be at least two new Metro board members, maybe more depending on the November elections. At the very least taxpayer funds should not be used for the plaques for the individuals. If they want a plaque fine, they can put it on the floor where people can step on it, if they are even paying attention. And as far as future generations, Jackie Dupont-Walker should be careful what she wishes for. Zev’s anti-subway measure set back the course of the Red Line at least ten years. The Eastside could have gotten a subway down Whittier and Atlantic, with direct connections to Downtown and the busiest bus corridor on the Eastside, but instead due to a petty political feud they only got light rail that, for the first 10 years, only brushes downtown. Just another reason we East County people hate the Westside. The Phantom, personally, refuses to go anywhere west of Downtown ! The City San Francisco is so pro-transit that it priorities it. That is so smart and progressive. That really says a lot about our elected officials, doesn’t it?